… and Grace gives herself a promotion. Dressage borrows lots of language from ballet -after all, we are the dancers of the horse world. Pas de Trois is a dance of three. I have commandeered that phrase to describe riding lessons as a conversational dance between horse, rider and instructor. All three participants have to be heard for the dance to succeed. I am always surprised at how much horses have to say during lessons. Listening is the best way to give up an adversarial one-sided stance and make progress in the art of positive leadership. Horses all give a big snorty-blow for that! Remember Grace? 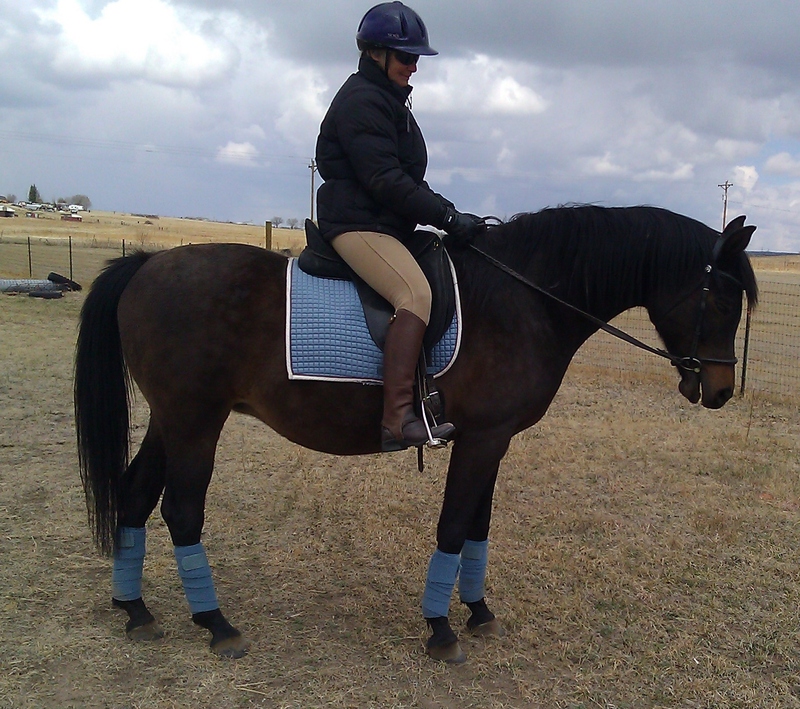 She had a show career in western pleasure before she came to Infinity Farm to be a dressage lesson horse. Once she had settled in and made some new friends, she went to work adapting to my strange dressage ways. We negotiated a language to share -one that included lots of stretching and bending. At first she was worried, but she began to understand and finally let out a tiny hum of a blow. I heard it more with my leg than my ear but it was a start. Grace has hit her stride now. Last week we were giving a lesson to a new student. Grace is kind and steady, but she doesn’t struggle with low self-esteem. She offered a fraction of her attention to the student but mainly watched me. We started in the round pen, with my student riding Grace and me on the ground. The student had waited a lifetime for this day -she was nervous and excited. It took the better part of the hour for our particular Pas de Trois to find a rhythm and flow in this first ride. Grace wasn’t going to relax until the student did, the student was doing her best, and I continued reminding them both to breathe. Eventually the student relaxed and Grace responded with swinging strides of forward movement. The shift was so obvious -and the student collapsed into a huge smile. Grace followed suit, with deep vibration and a joyous, noisy blow. Undeniable release -all around. Grace is figuring out this new job. She knows that I depend on her to call it as she feels it -so I can help her rider. Grace has also let me know that she resents the term lesson horse and prefers the title assistant trainer in the future. I absolutely love every part of this post. It’s a 3 way street – I’m delighted at how you approach the whole. I also laughed out loud at “she does not suffer from low self esteem” and of course Grace would be the assistant trainer. Another way of thinking about the lesson horse that so works for me.